with replacing the stratigraphy of large lacunas in the forward section of the church. 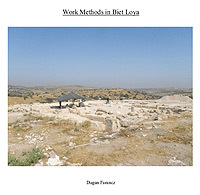 The work is conducted by a medium sized crew from the mosaic conservation workshop of the Israel Antiquities Authority. Due to the location of te site and the conditions on site there are certain logistical issues that have to be taken into consideration when work is being conducted on the site. The site is only accessible one day a week and for only half the day. All the work materials must be taken too and from the site each work day and there is no water supply on site.